It’s a known fact that our 6-year-old son loves going to Tom’s World at Robinsons Galleria every weekend and having Milo soft-serve ice cream afterwards. This mommy has her weekend routine, too, that coincides with the boy’s visit to Tom’s World every Saturday. When the little boy is busy playing racing games with his yaya, I usually sneak out to buy my favorite Mango Sago from The Mango Farm stall located just outside Tom’s World. Mango Sago is fresh mangoes on blended ice with tapioca balls. I love ripe mangoes and I like sweetened tapioca balls, so the combination is perfect, and because it has blended ice, the Mango Sago makes for a refreshing dessert or snack. What’s your favorite mango dessert/shake from The Mango Farm? 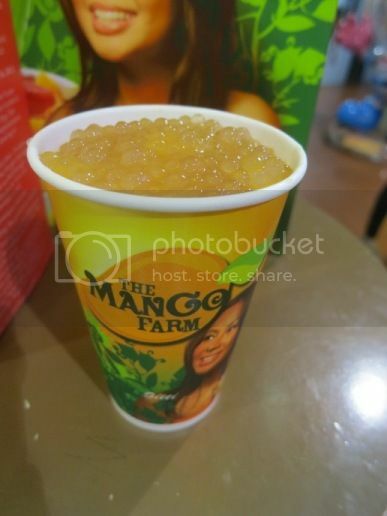 This entry was posted in Mango Sago, Robinsons Galleria, The Mango Farm. Bookmark the permalink.